I came across Peachykeen Organics a company with a small range of handmade, natural and organic skin care products. Peachykeen’s motto is “keep it simple” so the range is made without ingredients such as parabens, artificial fragrance or colours, petrochemicals, phthalates and PEG's. Peachykeen kindly agreed to let me review a product. I chose the Rosehip Face Oil because a) I have never incorporated oil into my skin care routine and b) Rosehip oil has been the talk of beauty magazines. Peachykeen say "A 'super-oil' for your face - think of it as food for your skin. Rosehip is renowned as a treatment for sun-damaged skin, fine lines and scars. Our rosehip is cold-pressed and organic so as pure as you can buy. Apply after cleansing last thing at night and let it work while you sleep." Sounds fantastic doesn't it? So can Rosehip Oil perform miracles? It certainly is an all rounder and it could help with eczema, psoriasis and acne. So where do I start with this review? As you can see from my picture the oil comes in a glass bottle with a pipette. This is the perfect design for a product like this because it allows you to be precise and limits spillages. I think I expected Rosehip to have a floral scent but instead the oil is neutral and I do not object to this. At first I was concerned about using facial oil which makes no sense as I have extremely dry skin. I thought oil would be too heavy and leave me with a greasy face. However, I was very wrong this is dry oil and magically disappears. I have been applying 2-3 drops of oil in the evenings after cleansing for the past four weeks. I even experimented one evening and applied a few more drops and it had no ill effects. My skin still managed to absorb the product overnight. In the morning my skin feels hydrated and soft with no trace of oil. I think I can see a difference in my skin tone especially on my chin where I have some old scarring (from eczema not an injury scar). I can see that this product will be of huge benefit to me in the winter months when my skin is at its driest. I always struggle to maintain moisture levels across the day so this could be the answer I have been searching for. 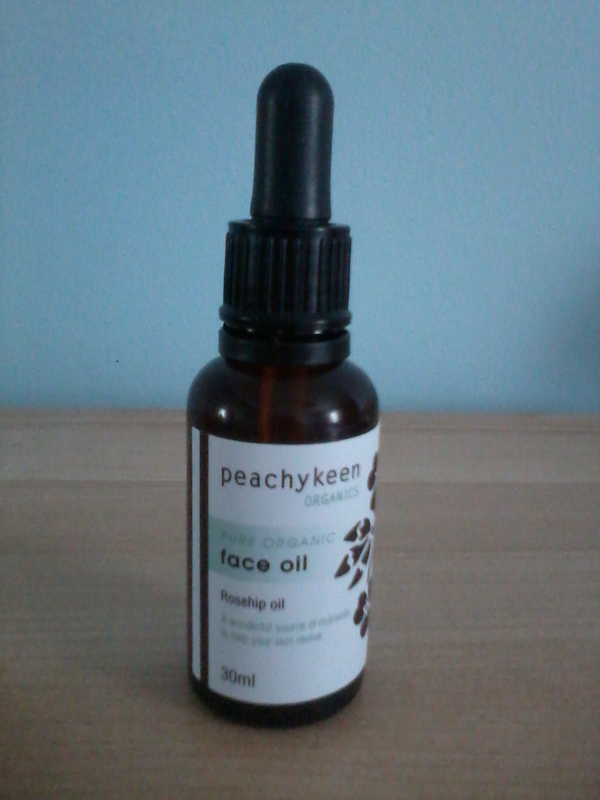 Overall, I am glad to have discovered Peachykeen Organics and I would like to try other products in their skin care range. If you have any skin problems at the moment I would recommend you give this oil a try, with time you may see an improvement. Peachykeen's Rosehip Oil is a very reasonable £11 for 30ml and is available in two varieties - Rosehip and Rosehip & Geranium for combination skin. I have been banging on about face oil to my friends for years. i tried organic rosehip oil about 2 years ago and have since tried other ones. i put oil on after every shower. I have dry skin and this stuff is a god send. not tried this brand but its a good price so will def give it ago.